As with many inventions of the era, no one individual can be credited for it's creation. 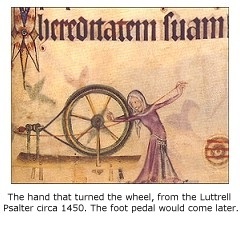 Unfortunately, no authentic spinning wheels survive from medieval times so primary evidence comes from images and written records of the era. The spinning wheel evolved from ancient times when spinning was done on a spindle, which is basically a stick with a stone or weight attached. One day, sometime between 500 and 1,000 A. D., somewhere in China, Persia or India and (perhaps inspired by the riches to be made in the Eastern silk trade), someone turned a spindle on its side, added a pulley and connected it to a drive wheel. The spinning wheel was born. However, the invention met strong resistance by the time it reached Western Europe in the early 13th century. Wool merchants saw it as an impairment in quality by producing thread that was lumpy and uneven. Medieval spinners often used a distaff, (a stick with a fork or comb on the tip used to hold long-staple fibers while spinning) to hold their fibers while they were spinning with a spindle. Although time consuming and awkward, the method produced more consistently even thread. Nevertheless, the machine was simply more economical, saving almost half the work of hand spinning and, with the later addition of a foot pedal... the spinning wheel was off and running.